Can your current security company provide you with a minimum of the last six months’ record of the scheduled guards at your site? Also, ask your current security firm for the guards’ names and individual security guards’ license numbers, which day and time each of them worked, and their written report for each shift. Your current provider should have these records instantly and the information should be provided immediately upon your request. 2. Can your current security company provide you with a record of the last six months payroll submitted to those guards who were listed to have been working at your site to ensure that those workers did not have their pay withheld, that they received at least legal minimum wage, and that employee taxes have been submitted to the government by that security company? This also proves that the guards were legally entitled to work in Canada. If your current security provider is not able to provide you with the above records or they refuse, you are having illegal employees working at your site, who are receiving less than minimum wage (sometimes withheld for months), and are illegal to be working in Canada. 3. Can your current security provide you with proof of the start and end times of each of the guard’s shifts and to demonstrate with proof that the guard was physically at your site, for a minimum of the last six months? This must include proof of location and proof of steady activity throughout each shift. If they pass the above tests, Congratulations you have a Trusted Security Company. 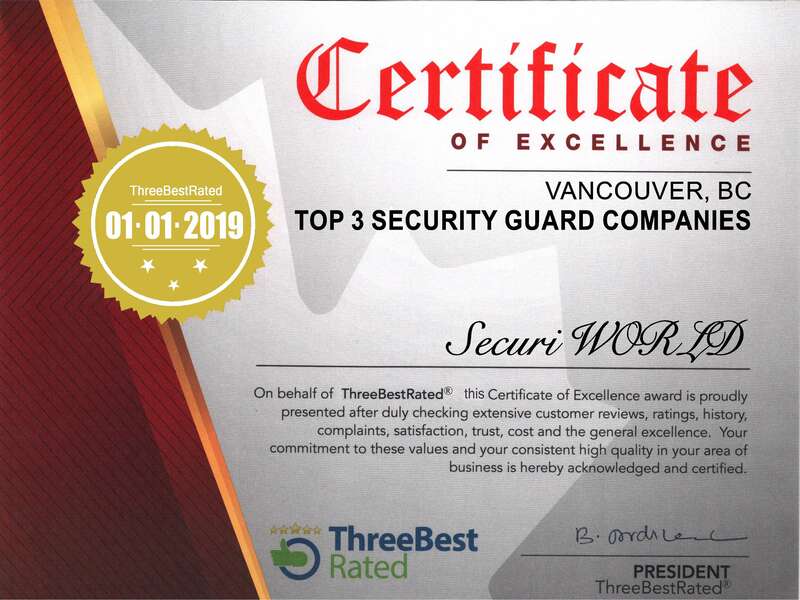 More and more companies are quickly switching to SecuriWORLD Canada because we are trusted for being the best in the business. Let me tell you why. When we schedule the employees we put them in a software that gives us their exact location at the exact time at any site. The software also shows us exactly which guard is qualified for your site and which guard is not qualified and it keeps a record of that. In addition, we have a guard monitoring division and their only duty is to monitor the guard and ensure every ten minutes that the guard is there on site. They also ensure that the guards are doing the patrols at the times you requested and remaining active. We also divide our field operations into two separate divisions which is field management and field support. In addition we have multiple quality assurance managers and supervisors working at all times of the day and night, year-round, and their only job is to ensure that each guard is aware of their job duties and trained well. The quality assurance managers and supervisors physically guide them around your property and train the guards on the duties that you specify for us to do which you may customize for each and every hour at no additional cost. The unique thing about SecuriWORLD is our requirement for live location reports, GPS tracking, and instant electronic incident reporting in real-time. We have the best account management team in the market who are very responsive and dedicated to excellent communications and understanding your needs in order to materialize your security goals through our multiple operations departments.